Exercises to increase bone density are a highly effective way of building up your bones. Not to mention cheaper than pills, and easily done! But before you start any exercises to increase bone mineral density (BMD) you should check with your doctor. Especially if you already have bone-related issues. If you already suffer from osteoporosis and are looking to strengthen your bones because of that, you need to be in good enough shape to workout. Especially if you're going to put strain on the spine with with different kinds of free-weight training. So that you strengthen your bones, and not hurt them. Also, to get the most out of your exercises make sure that you're eating regular, balanced meals and not smoking. Bad food and smoking will weaken your efforts to build stronger bones. …which all assist with bone creation! The main reasons to build up your bones are to avoid osteoporosis, bone fractures, and brakes. This is especially an issue as you age and your strength, balance, and bone integrity decrease. You can avoid bone breaks when you fall down, or to protect yourself if you do sports with hard impact. Football, mixed martial arts, muay thai kickboxing, and tons of other sports require athletes to be tough, not just strong. As with so many things, it's easier to add bone density when you're younger. You can build up sufficient bone strength just by running around and playing sports when you're a kid. But as you age adding bone density is more difficult. However, with the right exercise you can still add as much bone density as you need (or want). You just need to be active and do the right exercises to build up your bones. If you just sit around all the time, it won't happen. 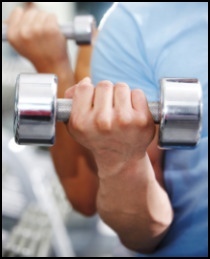 Increased bone mineral density is found in active individuals who do weight bearing exercises. These can be exercises that put impact strain on the body (ex: running, aerobics, dancing, etc.) or those that bear weights (ex: weight training, intense strength training, etc.). Non-load bearing exercises, like swimming and cycling, will do good things for your overall health. But they are not exercises to increase bone density. While weight bearing and resistance exercises are best, they only help the bones actually put under strain for the exercise. The ones that aren't involved don't get any benefit. In one study female rowers showed much more bone development in their lower spine - where the forces caused from rowing are much higher than at other parts of the body. Where you put the stress in your exercise is where your bones will get stronger. Some exercises are better and/or more intense at building up your bones than others. Start with what you're comfortable doing, and then keep going up!! Whether it's weight training exercises to increase bone density, workouts for sports, or some other reason - keep exercising. Or start weight training this week! The habit of regularly exercising is not only good for your bones, but for your overall health and happiness as well. • Click here to leave 'Exercises to Increase Bone Density' & go back to the Complete Strength Training Home-page! 1. Mackinnon, Laurel T. 2003. Exercise Management: Concepts and Professional Practice. Champaign, Ill: Human Kinetics. Pp. 232. 3. Moffat, Marilyn, Elaine Rosen, and Sandra Rusnak-Smith. 2006. Musculoskeletal Essentials: Applying The Preferred Physical Therapist Practice Patterns. Essentials in physical therapy. Thorofare, NJ: SLACK. Pp. 8. 4. Simon, Harvey B. 2002. The Harvard Medical School Guide to Men's Health. New York: Free Press. Pp. 130. 9. Morris FL, RM Smith, WR Payne, MA Galloway, and JD Wark. 2000. "Compressive and shear force generated in the lumbar spine of female rowers". International Journal of Sports Medicine. 21 (7): 518-23.